When Matthew the Apostle decided to follow Jesus, he left his profession in part because it conflicted with his faith. When Paul decided to follow Jesus, he too also left his profession because it conflicted with his faith. Even John Boehner resigned as House Speaker upon realizing he could no longer in good conscience, perform the functions of his position. Kim Davis, however, takes the position that defying her duties as a public officer, and in turn the law, is the appropriate action when her conscience conflicts with her position. Any time a government official infringes upon someone’s right, it is an injustice. Regardless of whether some people agree with the act, government officials should not play the role of judge and jury. 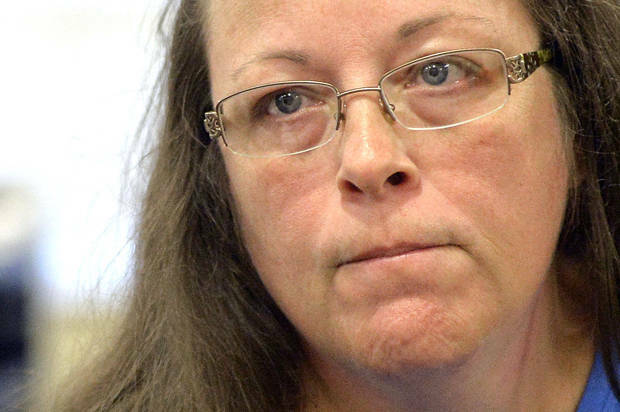 When Kim Davis refused to sign a marriage certificate for a gay couple, she used her authority to usurp the justice system. She became the judge and jury. Freedom of religion does not mean government officials can ignore the rules of democracy to enforce their beliefs. Render to America what belongs to America, which includes the three branches of government. Collectively, they are tasked with ensuring liberty and justice. The Court has held that a ban on gay marriage is unconstitutional. If that means a local clerk is conflicted with performing her job and, instead of fulfilling all responsibilities, she desires to pick and choose which responsibilities under the law she will enforce, then she must step down. And if the conflicting issue is of grave concern, she is free to use her First Amendment rights to campaign for reform. But Kim Davis abusing her authority because of her conscience sends the message that an individual rather than an institution, may govern. Given that some have used Christianity to support Ms. Davis’ actions, it is only fitting to mention that Jesus was not called to change man’s law. During His lifetime, many Jews refused to believe He was their Messiah because He did not overthrow Caesar’s reign. Instead, He was called to save the souls. If Ms. Davis felt called to refuse her responsibilities, like Matthew, Paul, and even John Boehner, she should have left the position. What she did sends the message that government officials may usurp America’s justice system when a law conflicts with their beliefs. That mantra does not belong to America.